With the high speed data transmission requirement in LAN, 1998 IEEE ratified standard 802.3z defined protocol 1000BASE-T over Category 5e and higher level Ethernet cabling system. After that, with the step into 21st century, Category 5e (class D) cabling took the place of Cat.5 cabling, and it became the main trend in data cabling market. As 1000BASE-T defines that the Cat.5e works in full-duplex mode, uses the complete 4 pairs to transceive in the meantime, then this means each pair will receive the interference from other 3 pairs, as well as the ground noise. Then this requires the link and components in use must be with sufficient headroom margin. 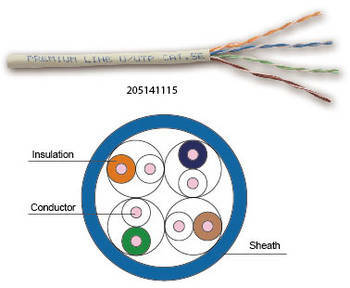 Premium-Line supplies complete Category 5e solutions and components, meeting and over standard ANSI/TIA 568-C.2, ISO/IEC 11801 ED.2, EN 50173-1, the Category 5e channel is guaranteed to fully support the corresponding protocols & communication services over 100 m. Moreover, as a Germany brand, Premium-Line provides you complete EU RoHS compliant solutions. Nowadays, with expansion services over Ethernet expediting, like IP phone, IP camera, security and control systems, intelligence home systems and etc., these do expand the traditional Cat.5e cabling market. Also considering the future telephone system upgrading, more and more telephone subsystems suggest using Cat.5e communication cable. Based on all of these, Premium-Line will always provide you adequate Category 5e solutions and warranties. Nor. Typ. Nor. Typ. Nor. Typ. Nor. Typ. Nor. Typ. Nor. Typ. Nor. Typ. Nor. Typ. Nor. Typ. Nor. Typ. Nor. Typ. Nor. Typ. Nor. Typ. Nor. Typ. Nor. Typ. 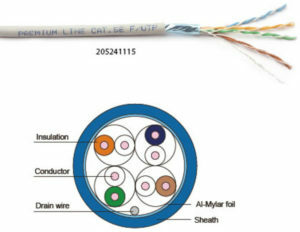 Premium-Line Category 5e gel filled cable is ideal design for outdoor cabling. 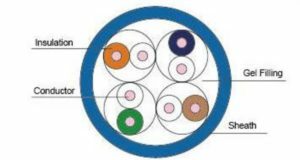 Each conductor is made of annealed 24AWG bare copper, to guarantee the conductor elongation strength, the semi-solid gel filling around each pair saves against water penetration and protects inner insulation from vile weather. The cable is finished with excellent PE out sheath, to ensure it could endure all weather condition in temperature range -40°C ~60°C.